Believed to be one of the oldest Ganesh temples in India, Dagdushet Halwai Ganapati Temple is one of the most important and visited Ganesh temple in Maharashtra. Situated in Pune District, it is located very near from the famous historical monument Shaniwar Wada, which was administrative headquarters of Peshwas of Maratha Empire. Dedicated to God Ganesh, the temple is visited by many people everyday especially on the ten day festival celebration of Ganesh chaturthi. The lighting of the temple during the Ganesh festival is marvelous. 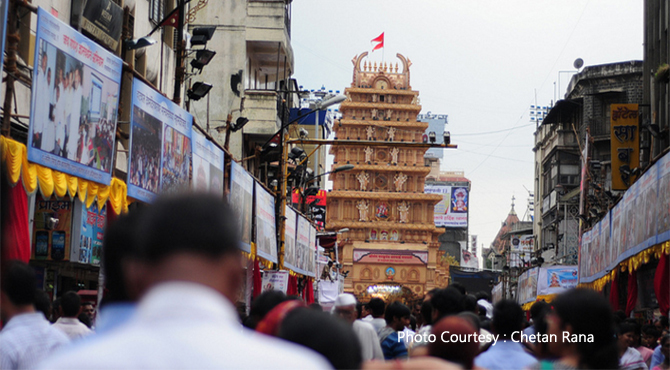 Dagdushet Halwai Ganapati Temple was built by Dagadusheth Halwai, a sweetmart seller. There is a myth behind this temple Dagdushet lost his son to the plague which plunged him and his wife in a state of depression. To shun away, this grief, he made idols of Lord Ganesha and Shree Datta Maharaj as per his Guru Madhavnath Maharaj’s advice . He later established the Halwai Ganapati Trust. Dagdusheth's good friend, Lokmanya Balgandharva Tilak during the British Raj, came up with the idea of transforming Ganesh Chaturthi into a public festival. Presently, the temple is is under the administration of this Trust. One of the richest in Maharashtra, the trust organises various cultural activities like singing concerts, bhajans, Atharvasheersh recitation etc. The trust also operates an old age home - Pitashree at Kondhwa, ambulance service for poor and health clinics in tribal belts of Pune. The temple is simple and yet beautiful, that allows the devotees to catch a glimpse of the Ganesh idol and watch the aarti and the pooja even from road without going inside the temple. The 7.5 feet tall and 4 feet wide idol is decorated with colors and gold ornaments. The idol of Ganpati has a solid gold ear and is decorated with nearly 8 kilos of gold. The Ganesh idol, adorned by gold and precious jewellery is rumoured to be insured for a sum of 1 crore. All rituals consisting of pooja, abhisheka and the arti of Lord Ganesh are performed here. Coconuts are offered to the God on a daily basis is the main feature of the temple. During the Ganesh Chaturthi, the demand of coconut reaches nearly five lakhs per day. Time : 6am - 11pm. No entrance fee. Photography is strictly prohibited.